The Reflector line of heads, inspired by drumming great Eric Moore, feature a new 2-Ply Hybrid Film combination that enhances the stick attack when played at higher volumes. These heads are meant to be played hard, fast and with passion. A new 17 mil Aquarian Hybrid film combination makes Reflector heads more articulate, deliberate and durable. 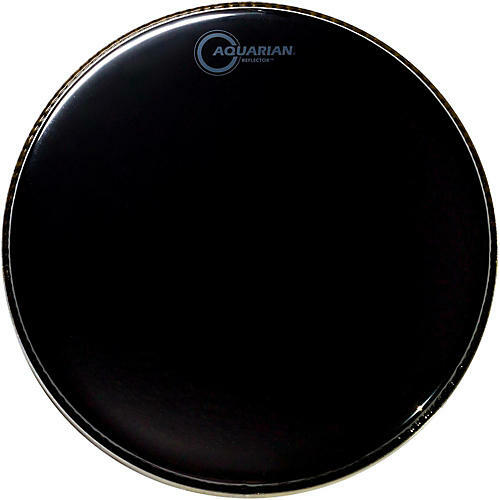 The bottom ply of this drum head series uses Aquarian's special 10 mil black drum head film which is denser and brighter than their standard drum head material. The Reflector top layer uses Aquarian’s Classic Clear 7 mil drum head film for warmth. The result is a head that is warm and musical at low volumes, bright and more articulate when played hard. The unique 17 mil Reflector hybrid combination is what makes this head durable and deliberate. This new hybrid construction diffracts and reflects the light, which results in a slightly “black mirrored” appearance. The reflective black mirror finish, combined with the muted Satin Black Logos, give these drum heads a stunning visual effect and adds even more of the drummer’s personality to their setup.